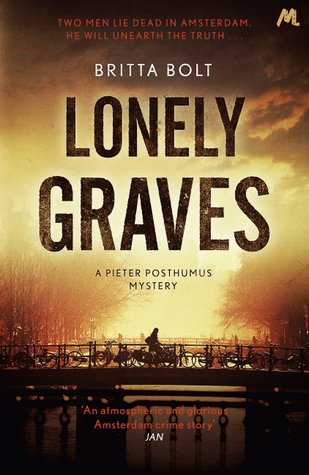 Lonely Graves is the first book in a crime fiction series written by Britta Bohler and Rodney Bolt under the pen name of Britta Bolt. Both authors draw on their professional and life experiences to write what I think will be a fantastic series. The Lonely Funerals series features Pieter Posthumus (Pieter is relieved when others do not comment on his last name at first meeting), a team member of the council department known as the Lonely Funerals team. The Lonely Funerals team is responsible for visiting the homes of those who die without family or friends willing to wrap up the deceased's affairs and take care of funeral arrangements. Pieter cares deeply for those deceased persons whose files appear on his desk, and he goes about making final arrangements for them with the utmost respect. Pieter is not a detective but, of course, there is going to be something suspicious and complex with each death that draws him into investigating. If the first in the series is a good measure, the investigations will lead into crimes surrounding very current issues (immigration and terrorism in this case). The Lonely Funerals series is off to a good start for me. I like the character of Pieter Posthumus and look forward to seeing him develop further as the series continues. I was a bit scattered as I tried to keep track of character names, and was stretched a bit by some regional descriptions because I have no familiarity with Amsterdam, but I found myself easing into it as the story and characters developed - this was aided by a list of Dramatis Personae in the front of the book (thank you Authors!). The pacing of the book was good, especially since the authors needed to spend time developing new characters and settings. The pace picked up toward the end of the book as the pieces of the crime(s) started coming together. I stayed up way too late reading in order to see what would happen! Books two and three in the series are already on my reading stack and I look forward to jumping into book two right away. I really want to spend more time with Pieter and (hopefully) some recurring characters that are a part of his life - this is an excellent sign of my enjoyment. I highly recommend this if you like crime fiction, a flawed and compassionate main character, and a plot that draws you into the story. Note from Terri: My apologies to those who have viewed this more than once. I was delayed in completing the list and forgot I had scheduled it to post automatically - twice. The following list is finally the finished version. Thank you for sticking with me, Friends! I'm a librarian with a passion for helping others navigate the insane world of information. After hours, I read voraciously then talk about it. © Terri B. 's Terri Talks Books 2017 | All Rights Reserved. Simple theme. Powered by Blogger.